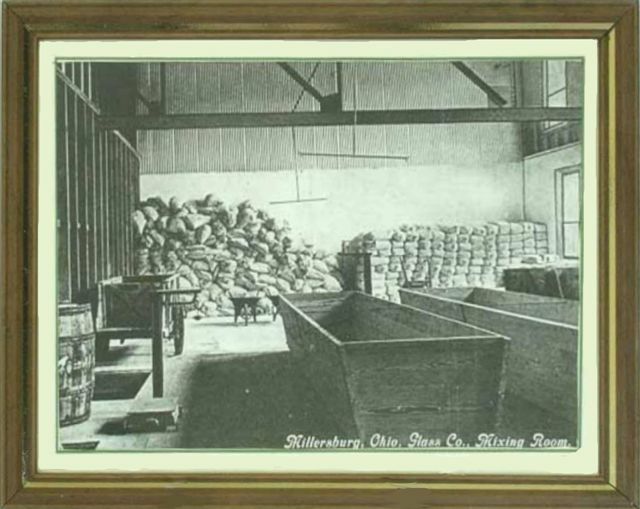 One Share of Millersburg Stock. 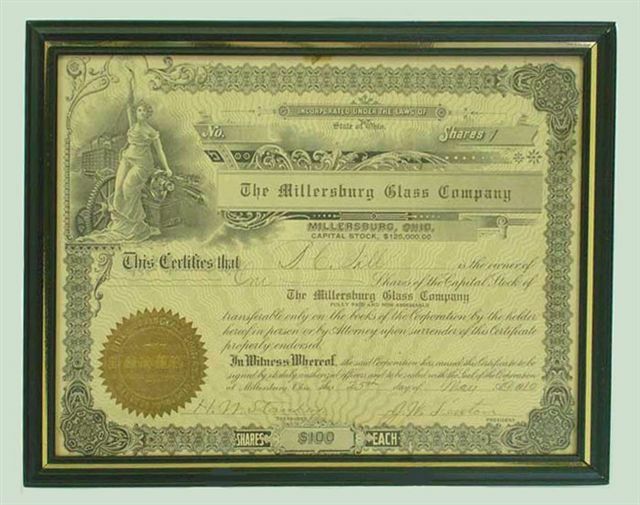 Millersburg Stock Certificate: brought $215. 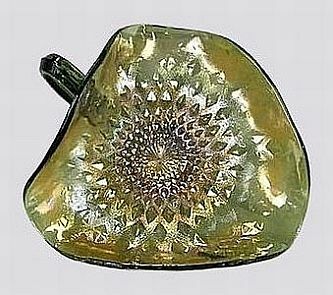 when sold during Marie McGee’s auction in July 2009. DIAMONDS in SNOW or STIPPLED DIAMONDS. Left: DIAMONDS in SNOW - 6 in. across x 3 inches high - sold for $2066. Right: DIAMONDS in SNOW - Green. 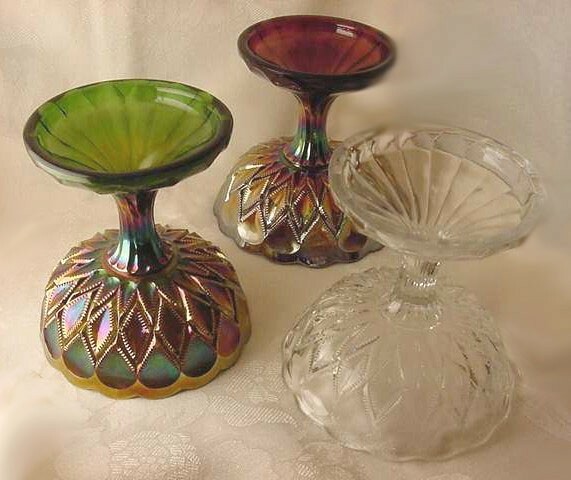 DIAMONDS Punch Bases: Steve Maag tells us he has owned the crystal base for 10 years, the green one since 2004 and the amethyst example since 2007. He really would like to complete the “set”, should anyone be willing to share a blue and a marigold with him. Green Tri-corner NIGHT STARS Nappy. Tri-corner Amethyst NIGHT STARS Nappy. 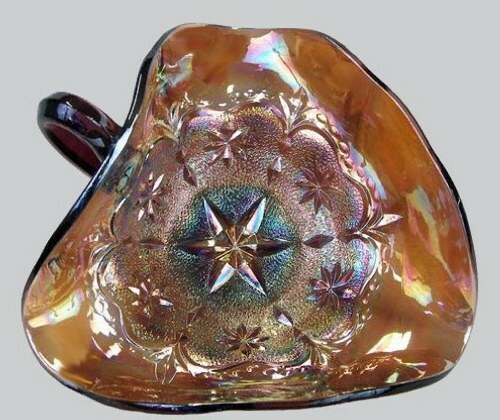 NIGHT STARS Nappy: Only one of these in amethyst tri-corner shape is known. It has sold at auction for $900. HANGING CHERRIES with Hobnail Ext. 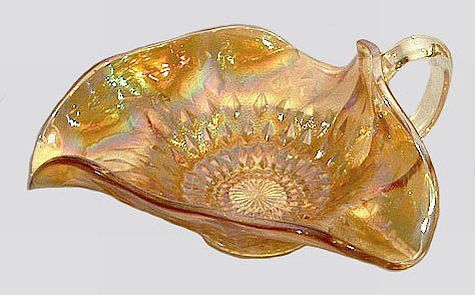 : 10” size bowls are rare. Only eight to ten are known in amethyst carnival. Marigold is more difficult to find with only four known to exist. A couple of blue bowls are known, with one reported in green. 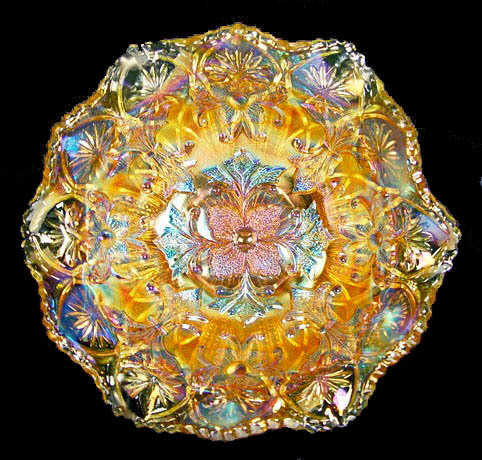 A small 5” size bowl in blue has also been reported in this pattern. 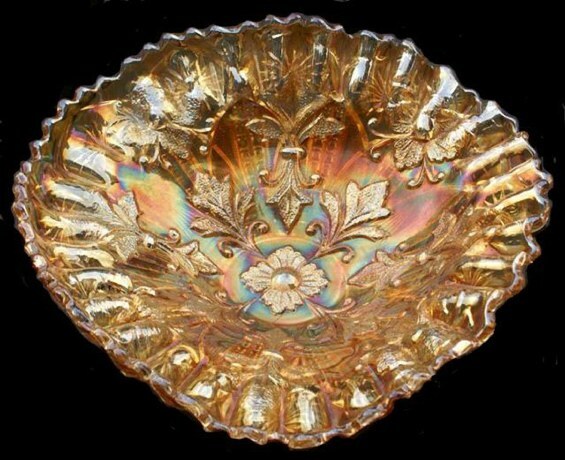 FLEUR-DE-LIS Collar Base Bowl - Vaseline - Sold for $4000. FLEUR DE LIS - Green. 9.5 in. x 8.75 in. x 4.5 in. at the tallest point. FLEUR DE LIS: This motif is associated with royal families of France. The exterior pattern is Country Kitchen. 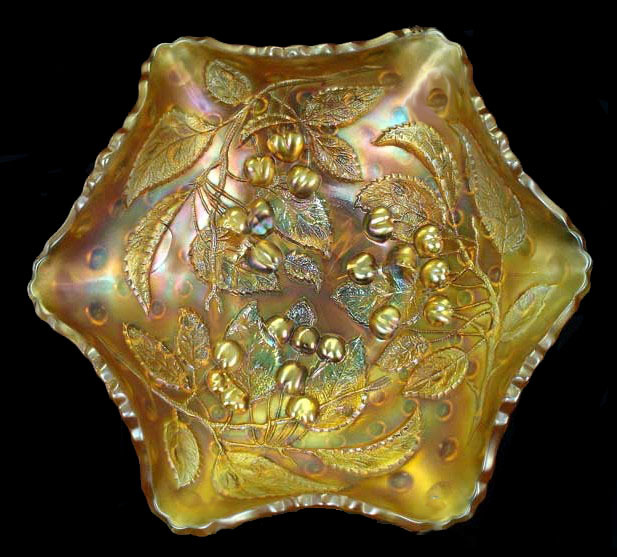 Fleur De Lis is also found as an interior pattern on some Hobstar and Feather punch bowls. 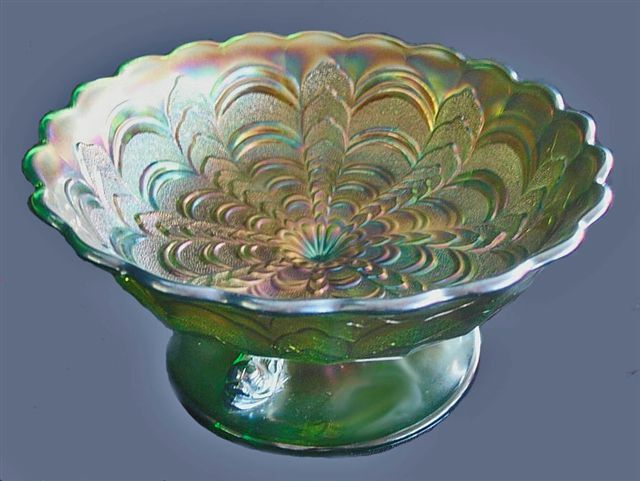 A wide range of bowls in many sizes and shapes are found in either satin or radium finish. 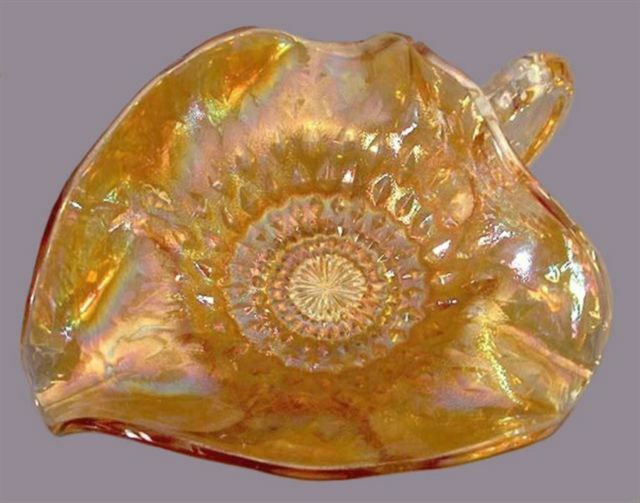 Collar base bowls are harder to find than those with domed base. 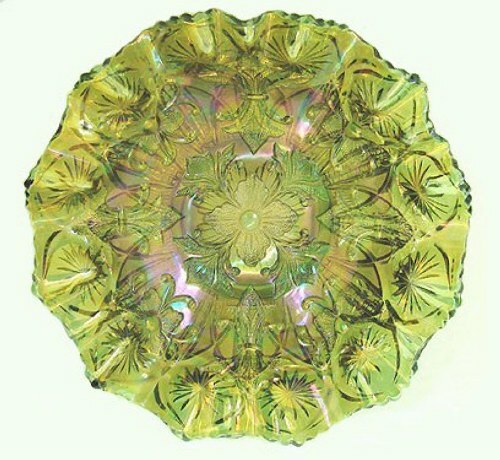 Amethyst, green and marigold are best known. One vaseline example is known. 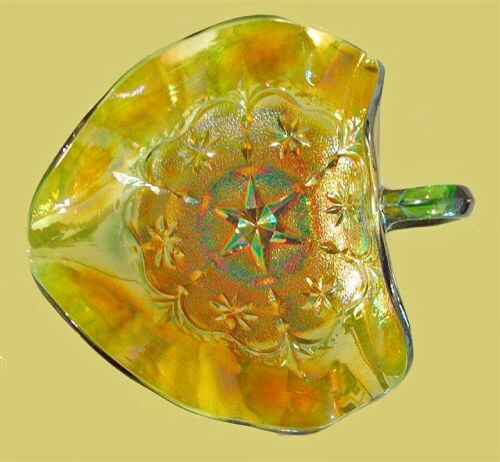 Tri-cornered examples have radium iridescence and good color, making them highly desirable. Green DOLPHINS Compote. Courtesy Ron & Mary Ann Bowen.